It is always delightful to come across old family papers and letters that relate to family history. 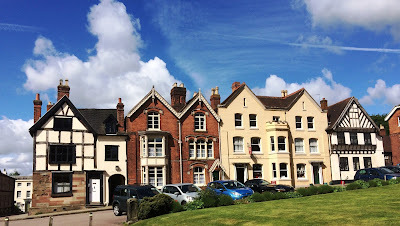 Recently, in these bright evening, I have found myself poring over some Victorian handwritten papers, notes and letters I have received dealing with the Comberford family and the ownership of the Moat House in Tamworth. At the moment, the Moat House is up for sale, but it has a sad appearance, forlorn and isolated on its own grounds between Lichfield Street and the banks of the River Tame, standing empty and looking abandoned with its windows boarded up. So, a detailed examination of these papers and letters, which came to me in recent months, has brought the story of the Moat House in the Victorian era back to life and is giving me hope that the Moat House in turn may be given a new lease of life. In 1815, Dr Robert Woody (1770-1823) became a tenant of the Moat House. He had been a House Surgeon at the Salop Infirmary in Shrewsbury, and later served as a doctor on board East India Company ships, before moving to Tamworth early in 1800. In 1806, he was one of the two bailiffs of Tamworth. In 1815, he moved into the Moat House, where he was a tenant of George Townshend (1778-1855), the 3rd Marquess Townshend, who had also inherited Tamworth Castle. However, Lord Townshend was involved in a number of high-profile scandals and court cases, including his wife’s bigamous second marriage, claims to succession to the family name and title by a man who was not his son, and an accumulation of debts that eventually lost Tamworth Castle to the family. Townshend mainly lived abroad, leaving Woody undisturbed at the Moat House, and Woody soon had the house licensed as an asylum. Meanwhile, John Robins, a London auctioneer, claimed Tamworth Castle and the Moat House in lengthy legal proceedings over debts owed to him by the 2nd Marquis, who died in 1811. Robins moved into Tamworth Castle in 1821, and the papers conveying the Moat House say that it then included a paddock and gardens, two houses and two barns in Lichfield Street, 8 acres and 2 roods, the liberty of keeping and marking six swans on the River Tame and River Anker, the right of fishing in the moat, and other ancient privileges belonging to and enjoyed by the possessors of the property, along with the burial place in the North Chancel of Saint Editha’s Church, Tamworth. John Francis Woody followed in his father’s footsteps as a doctor, training at the Medical School in King’s College, London. For three years, until 1842, he was the house surgeon and apothecary in the Stockport Infirmary. He also invested in the burgeoning railway industry: he was a director of the South Union and Leicester and Tamworth Railway, invested in the South Midland Railway, and in 1846, curiously, took out 15 shares at £22.10 in the Waterford, Wexford, Wicklow and Dublin Railway Company. With his mother’s death, Woody took over running the asylum at the Moat House. But he was interested in being more than the resident surgeon at the old Jacobean manor house. A series of cuttings from the Staffordshire Advertiser from 1843 in the Moat House papers shows Woody followed the Townshend and Ferrers peerage case with enthusiastic interest. But the papers that I now hold show that Woody’s attention soon turned to determining whether he had any rights as the proprietor of the Moat House. The correspondence shows that in September 1852, Woody commissioned the historian Markham John Thorpe (1817-1863) to delve deeper into the history of the Moat House, and to see whether he had any rights and privileges that might have come from the previous owners, particularly the Comberford family. Thorpe was a son of Thomas Thorpe (1791-1851), a bookseller in Piccadilly and Covent Garden, London, with a special interest in historical, genealogical and topographical works, and the Staffordshire antiquarian William Salt bought much of his autograph collection. While his brother inherited his father’s business, Markham Thorpe seems to have inherited his father’s interests. Although he had some connections with Oxford, he had no academic qualifications. But he was a senior staff member at the State Paper Office, until he resigned in 1848. Later he worked for William Salt, and he edited the two-volume Calendar of the State Papers Relating to Scotland, 1509-1603, published in 1858. While Thorpe was working for Salt, Woody commissioned him to carry out research into the old families who had previously owned the Moat House in Tamworth. The collected papers include miscellaneous excerpts from short family tress found in the records of the Heralds’ Visitations of English counties, including the Visitations of Staffordshire by Robert Glover and William Flower (1583), Sir Richard St George (1614), and Sir William Dugdale (1663-1664), who was accompanied by Elias Ashmole and Gregory King, who were both born in Lichfield. Thorpe provides miscellaneous snippets he gleaned from records he found in Oxford and Cambridge colleges, and there are notes from the Staffordshire county histories by Dr Robert Plot (1686), the Revd Stebbing Shaw (1798), and Sampson Erdeswicke, written in the late 16th century and republished in 1844. He provides excerpts from the parish registers of Saint Editha’s, Church, including the baptisms of children born to families who lived in Comberford and in the Moat House. These excerpts include the notice that Richard Waughton of Comberford, who was killed in the fighting at the Siege of Lichfield was buried on 21 March 1645. Thorpe’s work on behalf of Woody took him to Lancaster, Chester, Lichfield, Tamworth, Stafford, Burton and Leek. He was particularly interested in establishing whether the Comberford family had the right to be buried in the Comberford Chapel in Saint Editha’s because they had built the chapel or because they lived in the Moat House. The papers show how Thorpe searched for the wills and letters of the Comberford and Harcourt families, and combed through the charter rolls, muster rolls, patent rolls, close rolls, court records, and the court rolls of Tamworth back to the reign of Edward I, through wills in Lichfield and London, and a selection of Staffordshire records. At times he was assisted by the antiquarian William Hylton Longstaffe. He failed to find the wills of either Thomas Comberford, who died in 1597, or Walter Harcourt, who died in 1599, but found the wills of William Comberford, dated 1625, and of William Comberford, dated 1656, and sent abstracts of both these wills to Woody in October 1852. He went on to search in the Prerogative Court for the wills of Mary Harcourt (1603), Edward Harcourt (1609), Humfrey Comberford (1610) and Anne Comberford (1626), but failed to find them too. But he came across the wills of Robert Comberford (1669), proved in 1670, and Anne Comberford (proved 1670), widow of William Comberford. When he found the will of John Comberford (1560) in November 1852, he was confused about the details of the family trees, pointing out: “but he was of Wednesbury not Tamworth.” Eventually he found the administration of the effects of Anne Comberford (1626), dated 1632. In Lichfield, Thorpe searched through 20 volumes of episcopal registers and the registers held by the Dean and Chapter of Lichfield Cathedral for evidence of Comberford family funding of the Comberford Chapel. Thorpe appears to have been Woody’s guest at the Moat House in January 1853, returned again in February 1853, when Woody and Thorpe looked at the Comberford Chapel, and was back in Tamworth in April 1853. At times, he tells Woody he is making no charges for his work, but at other times he demands payment in postal orders made payable in Stoke Newington. Inevitably, it appears his charges are related to his own personal needs rather than the work he has carried out. Much of this work seems to have been carried out while he was also working for William Salt. Thorpe invited himself back to the Moat House in Tamworth later that month, with his wife, as a guest of Woody. But the begging letter was the final piece of correspondence between Thorpe and Woody and their friendship appears to have come to an abrupt end soon after. Most of Thorpe’s notes on his searches in Staffordshire records are deposited in the Stafford Record Office and the William Salt Library in Stafford, and the Hollins family later added most of Thorpe’s other notes on searches about the Moat House and the Comberford family. Woody had failed to establish his claim to burial rights in the Comberford Chapel, but continued to seek what he regarded as his rightful place in Tamworth society. In 1856, he paid for the bells of Saint Editha’s Church to be rung over two days to celebrate the wedding of Sir Robert Peel, 3rd Baronet, and Lady Emily Hay. In 1863, Woody opened the Moat House for the Tamworth Horticultural Show. At the show, over 2,000 people trooped through the avenue of lime trees to admire the display of flowers, fruit and vegetables. The show included archery, dancing to the strains of the Warwickshire Militia Band, and a fleet of pleasure boats on the waters of the River Tame at the foot of the gardens. 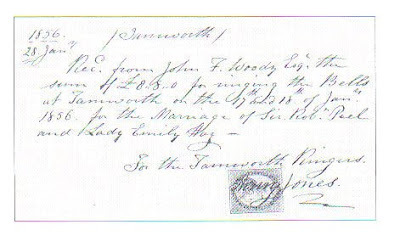 In 1865, Woody had extensive correspondence with CW Swinfen Broun of Lichfield on the Swinfen case. As an asylum, the Moat House was a private nursing home for the mentally ill. The patients were often well-to-do but eccentric old ladies who enjoyed living in the gracious house, and who went out in a horse-drawn landau around the streets of Tamworth to shop, bestowing largesse on the shopkeepers and errand boys who ran out to serve them. John Francis Woody continued to live at the Moat House until about 1888, and died in 1894. His grandson, Edward Hollins, was the owner of the Moat House from about 1888, and was licensed to run the asylum. After his death, the Moat House and its furniture were sold in 1922. Some of the remaining correspondence between Thorpe and Woody, including Thorpe’s begging letter from Lichfield, were not deposited in the Stafford Record Office, and remained with the descendants of the Woody and Hollins family until recently. As many of the records Thorpe was combing through had not yet been published, and he had no indexes to help his searches, his work is impressive. But he lacks the scientific approach of later historians, is unsure of the intricate details of the genealogies of the Comberford family, and often relies on what he expects Woody to want to hear when it comes to the rights of burial in the Comberford Chapel in Tamworth. Almost half a century later, my great-grandfather, James Comerford (1817-1902) would also take an interest in the Comberford family’s connections with the Moat House and the Comberford Chapel, visiting Comberford Hall, the Moat House and Saint Editha’s Church, as well as Lichfield and Wednesbury. Perhaps he too hoped to recover or assert claims to the rights of the Comberford family. But, in the meantime, apart from Woody and Thorpe, what happened to the other members of the cast in this drama? George Townshend (1778-1855), 3rd Marquess Townshend, had been at the centre of a long-running scandal after his wife Sarah ran off with a brewer John Margetts and married him bigamously in Gretna Green in 1809. They had several children who assumed the Townshend name, and their eldest son, John Townshend (1811-1903), assumed the title of Earl of Leicester. Townshend’s brother bought back Tamworth Castle in 1833, but his family never recovered the Moat House. For the rest of his life, Townshend lived in exile in Italy and he died in Genoa on 31 December 1855 at the age of 77. In Thorpe’s opinion, the Hon Henry Howard (1795-1868), the Dean of Lichfield, was of no use “except to give good dinners.” But at the time Howard was well-respected Old Testament scholar. He took a prominent part in the restoration of Lichfield Cathedral and with Bishop John Lonsdale in the foundation of Lichfield Theological College. He died at Donnington Rectory in Shropshire in 1868. George Hodson (1787-1855), Archdeacon of Lichfield and Vicar of Saint Mary’s, was deserving of “a good hiding,” according to Thorpe. In 1851, he had succeeded the Revd Henry Lonsdale as Vicar of Saint Mary’s, Lichfield. But he resigned in 1855, probably for health reasons, and went on holidays with his two daughters in Northern Italy and the Tyrol. He died suddenly in Riva di Garda on 12 August 1855 after a cholera attack. He was 68, and was buried in the Roman Catholic cemetery in Riva. A monument to Archdeacon Hodson was carved in 1860-1862 by Thomas Earp (1824-1881) for the architect George Edmund Street and stands in the south choir aisle of Lichfield Cathedral. Meanwhile, the Moat House, which stimulated everyone’s interests in rights in the Comberford Chapel, remains isolated and untended, “boarded up and empty” as the Tamworth Herald reported ten days ago [2 August 2015], waiting for a buyer.